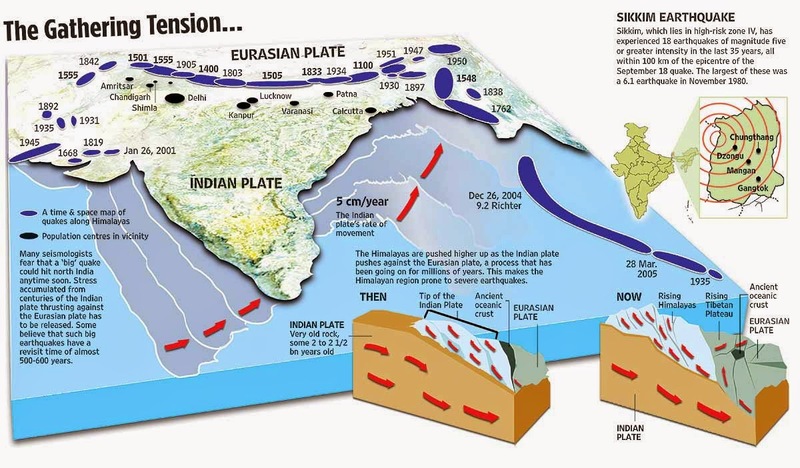 But someday – perhaps tomorrow or perhaps in 100 years – a massive earthquake will hit the region, and the consequences could be catastrophic: as many as a million lives in the Ganges river basin could be at risk, primarily because buildings have not been constructed to be earthquake resilient, despite the fact that the relevant building codes are in place. Of course, earthquakes don’t respect borders, and India is not alone in being at risk due to poorly constructed buildings. Northern India lies in the Alpine–Himalayan earthquake belt, which stretches from the Mediterranean to the Pacific. It is the second-most seismically active region in the world, and responsible for around 20% of the world’s largest earthquakes. The belt is being created by ongoing plate tectonics: as the African, Arabian and Indian plates continue to move northwards, they collide with the Eurasian plate. The earthquake belt includes the most famous of the great trade routes, the Silk Road, which follows the edges of deserts and mountains, and high plateaus like Tibet. The landscape of the Silk Road has been shaped by earthquakes over millions of years: forcing mountains upwards and making life in the desert possible by controlling where water comes to the surface. As the earthquake faults grind rocks together they make an impermeable clay, which often forces water to the surface along spring lines, determining where people live. To the casual observer, it seems as if the major earthquakes in this part of the world often seem to ‘target’ towns and cities but, in reality, people are often simply living where the water is, which is also where earthquakes happen. Between 2 and 2.5 million people have died in earthquakes since 1900. Approximately two thirds of those deaths occurred in earthquakes in the continental interiors – places like northern India. Over that time, advances in the scientific understanding of earthquakes have been translated into impressive resilience in places where the hazard is well understood, which are mainly on the edges of the oceans. With additional funding from the Economic and Social Research Council, EWF expanded to include social science and policy dimensions. The project, which runs until 2017, has three overarching objectives: to increase knowledge of earthquake hazards across the region; to establish greater resiliency against these hazards; and to establish a well-networked interdisciplinary partnership to support local earthquake scientists. Within Asia, there are more than 50 national level stakeholders who are working with EWF on earthquake risk reduction. Across much of the earthquake belt, people live in large cities, mostly in poorly built apartment blocks and buildings that have not been designed to withstand earthquakes. Large cities such as Tehran, Almaty and Bishkek have all been destroyed multiple times by earthquakes, and it’s only a matter of time before the next one hits.